Needless to say, this week started out stressful and hectic, kicked off with two full days of midterms. After that, we moved on to chocolate, which I have yet to develop and affinity for. I’m not a chocolate lover. I love chocolate flavored things (cakes, cookies, etc. ), but straight up chocolate is kinda meh and to be honest, good chocolate is completely wasted on me. If I’m going to have a piece of chocolate, I’d much prefer a Hershey’s or Cadbury’s than one of the fancy (and overpriced, in my opinion) brands. There, I said it. Don’t judge. Midterm Monday started out crappy and continued that way. I realized halfway to school that I’d forgotten my lunch, which really sucked because we wouldn’t really have a break during midterms so I needed something quick to eat. I stopped at Starbucks on the way in and grabbed a coffee and one of those cheese and cracker snack box things. I was in a rush and parked illegally so I didn’t notice that they screwed up my coffee (again). Seriously people, how hard is it to get right?? If I’m paying $5 for a drink I expect it to be right. It wasn’t even that complicated… Great. I got to school and we started with the written exam. We had 3 hours to do it, and I think I finished in two. I felt pretty good about it for the most part, but you never really know until you get your marks back. Comparing answers with friends is also never a good idea. Once everyone was done the written part, we moved into the practical. We were able to get a head start on this which was great, as we were on a tight schedule. I didn’t take any pictures this day, mostly because it was all stuff we’d done before, but also because I was having a crappy day and managed to botch something in every single recipe. Right off the bat with the baguette… I forgot to put the salt in until I was almost done the kneading. I tossed it in and incorporated as best I could, but this really set the tone for the day. My macarons were too big, my croissant dough was too lumpy, and my creme anglais was too runny (or so I thought at least). We were done our scheduled stuff early, so we were able to get a head start on tomorrow’s checkerboard cookies, which was good. We finished the baguette today, but I didn’t manage to get a picture of it. It was a long day, made even longer by a miserable, rainy, dark drive home. The normally 45min drive took almost and hour and a half. I was not a happy camper when I got home, and I still had an entire day of midterms to go. 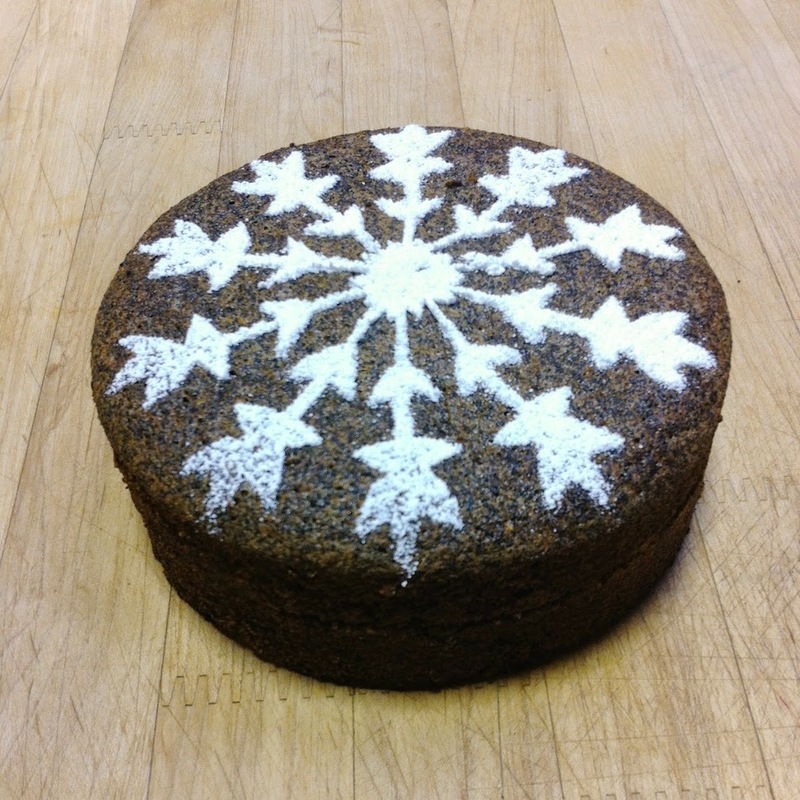 We spent the day finishing up the things we started yesterday and making the poppyseed cake. 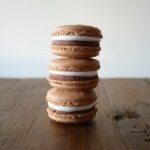 Though my macarons were a bit too big, they still turned out pretty well and were uniform in size, which was good. 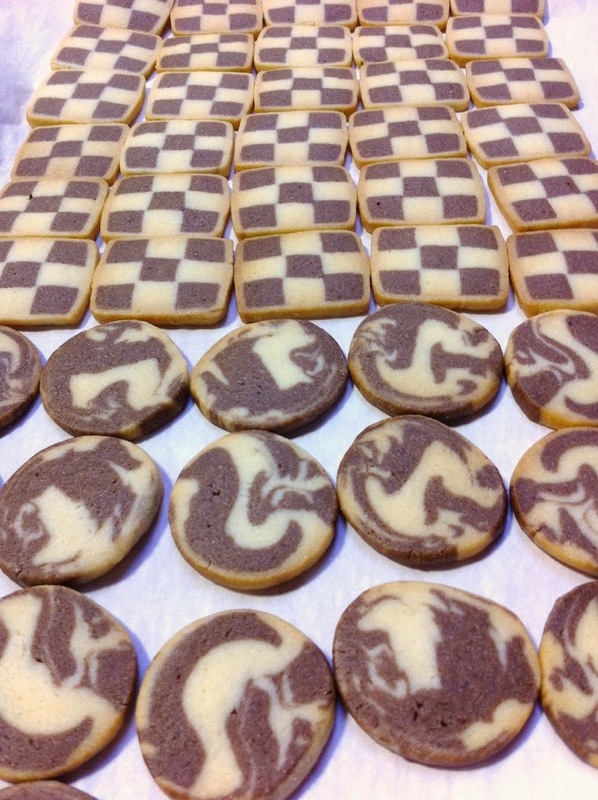 I was worried about my checkerboard cookies… they were SO much smaller than everyone else’s, so I knew something was off. 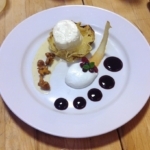 As it turns out, the Chef’s said I had one of the best in the class and that everyone else’s were too big. Go figure. Sometimes it’s better to be the odd one out, but it never feels like that at the time! 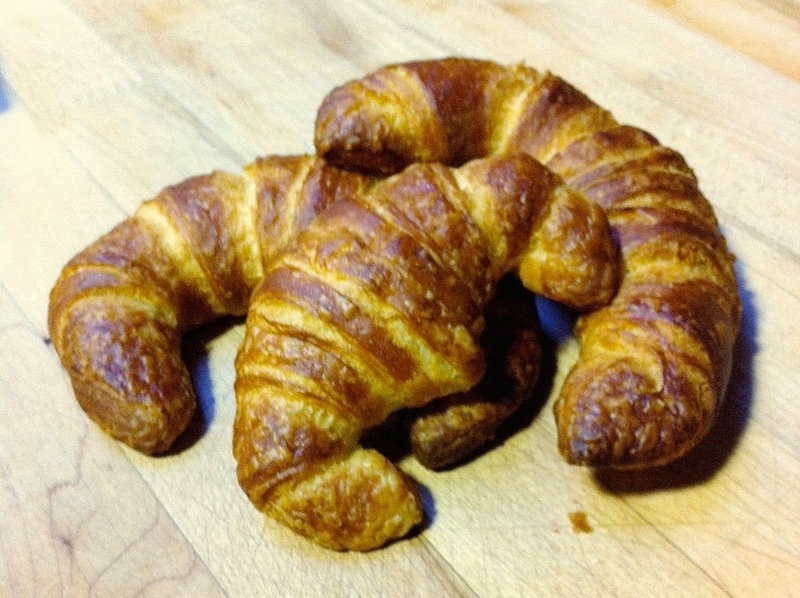 My croissants were just ok. I think the dough was still too cold when we started working on them. We had it in the freezer overnight so that it wouldn’t proof, and I don’t think we let it thaw enough before we started working on it. 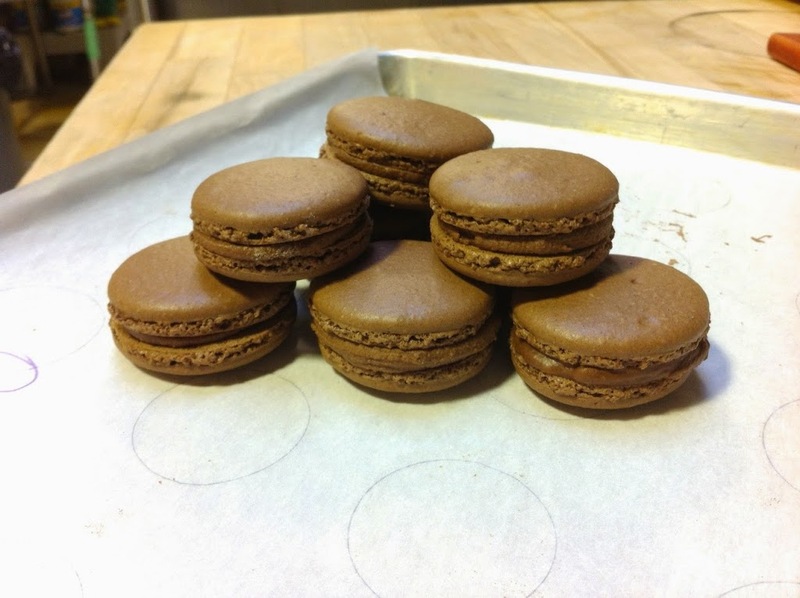 They turned out kinda flat for everyone (we thought we’d over-proofed them, but we didn’t). Everyone’s looked pretty much the same, so I guess that was good? It at least made me feel better about mine! 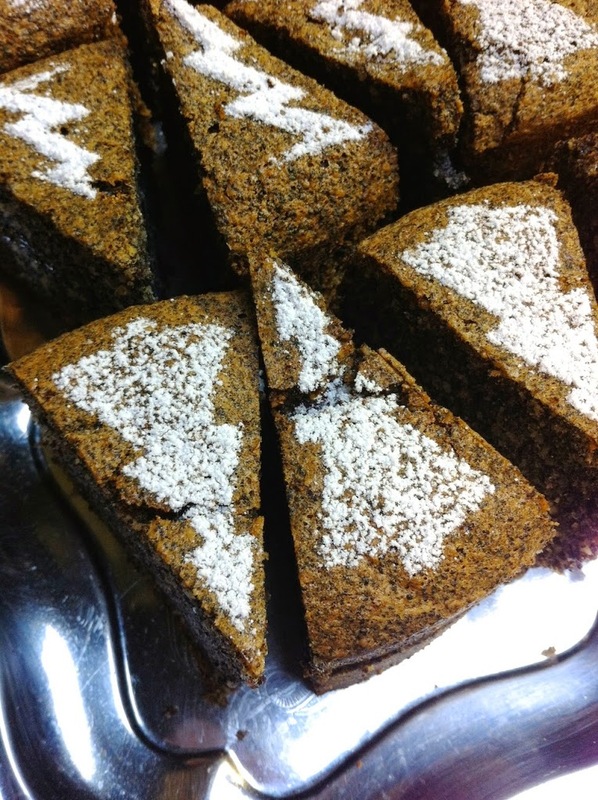 The poppyseed cake seriously pissed me off. I’d made this twice before in class and had very little cracking on the top. 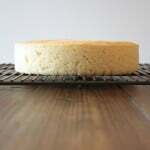 The first time I made it, it was almost 100% crack-free, which Chef Stacy said was almost impossible to do since it always cracks while baking. Here’s a pic of the first one I made. Almost perfect, right? The second cake I made last week cracked a tiny bit more, but still really good overall. The cake I made for midterms probably cracked the most out of everyone else’s cakes. Wtf?! I seriously could not believe it, and was so frustrated at this point. 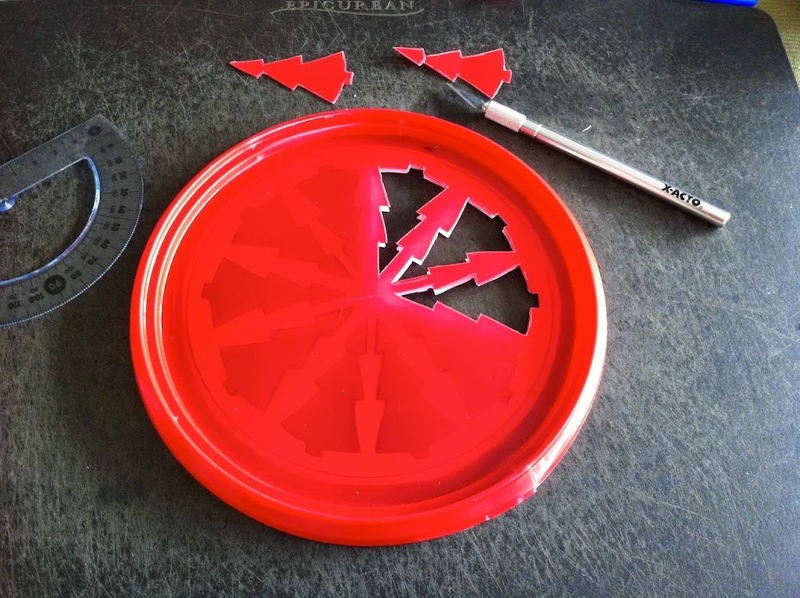 I spent a lot of time making the stencil for the top of it, and it just didn’t look good because of all the cracks. I forgot to take a picture of the whole cake – it was honestly the last thing on my mind. Here’s a pic of a couple of the better looking portioned pieces. My baguette from yesterday was just average. It was not my best baguette (far from it) and it ended up being my lowest mark item on the practical. I did still get 80% on it though… We got all of our marks back at the end of the day, for our practical and written. I really love how quickly we get our feedback! The waiting is agony so I really appreciate the Chefs getting the grades back to us right away. As bad as my two days were (or seemed to be), I still did really well on both the written and practical. I somehow managed to get an awesome mark on both, which I was so shocked and really happy about. As bad as my stuff seemed to me (because it was worse than I’d done before), I guess it was still pretty good by the Chefs’ standards. I can’t help but be hard on myself when it comes to stuff like this. I have very high standards, and don’t cut myself any slack when I mess something up. I should be looking at it as a learning experience, but the perfectionist in me has a hard time getting past that. With midterms over we moved right into Chocolate week. It was a bit intimidating and I wasn’t super enthusiastic about it. 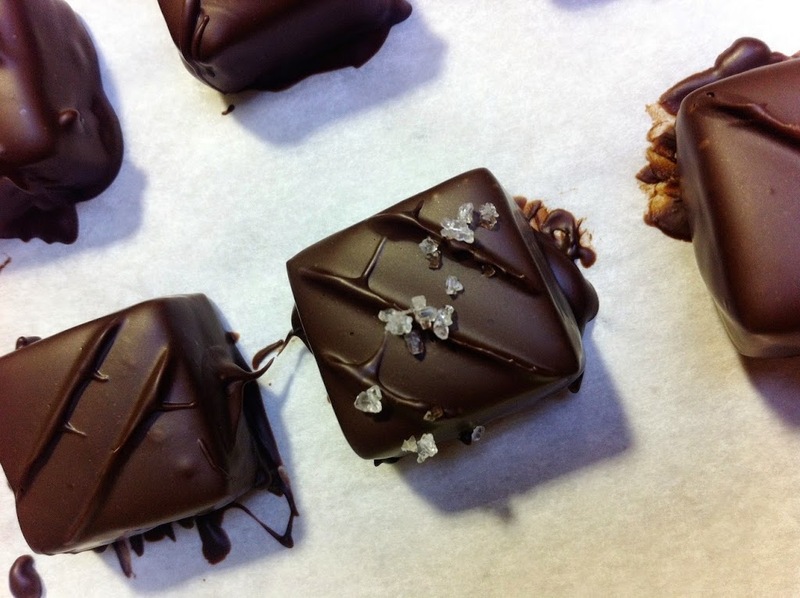 Tempering chocolate was a foreign concept to me, and it seemed really complicated. 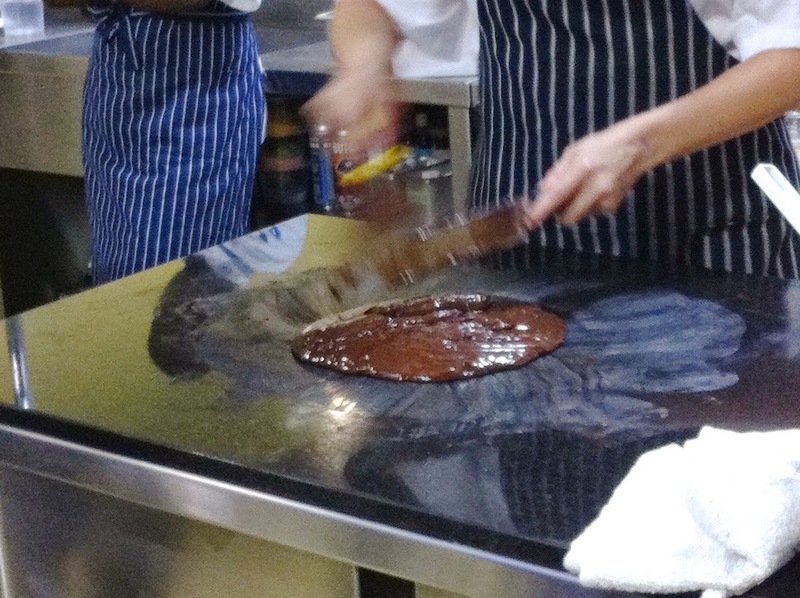 Tempering chocolate is an essential step to be able to work with it. 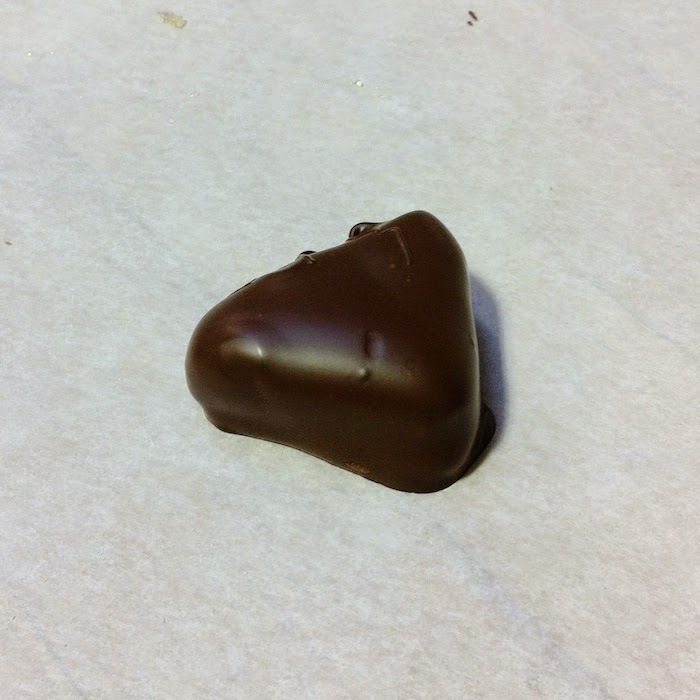 Tempered chocolate will give you a shiny finish, chocolate that snaps when you break it, and it won’t melt in your hands. All of the chocolate you purchase has been tempered. 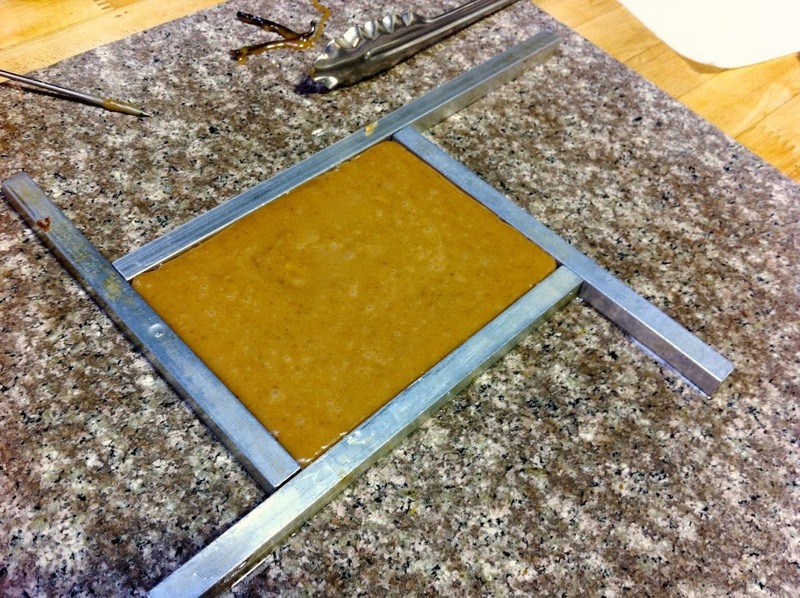 To do this, you first have to melt the chocolate and get it to 45ºC, then cool it to 25ºC by marbling (shown below) or various other methods, then heat it back up to a working temperature (usually between 25ºC and 32ºC and no higher) and KEEP it in this range. Any higher or lower will throw your chocolate out of temper and you’ll have to start all over. This means you’re constantly monitoring your chocolate and heating it over a bain marie every once in a while to make sure the temperature stays in the right range. It’s also important not to let any solidified bits of chocolate (there will be tons on the side of your bowl) fall into your melted chocolate, as this will also throw it out of temper. It’s actually not as hard as I thought it would be, but I’d be lying if I said I enjoyed it! Here’s my bowl of tempered chocolate ready to go. 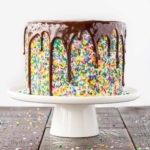 To test for tempering you can dip a cake tip into chocolate and put it in the fridge for a couple minutes. 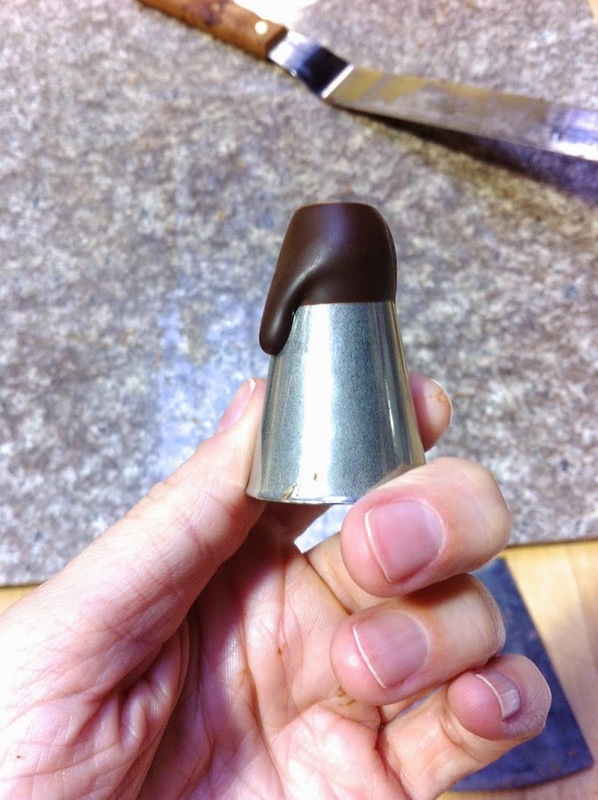 If it comes out shiny and solid (pulling down on the chocolate with your finger wont budge it), then it’s good to go! 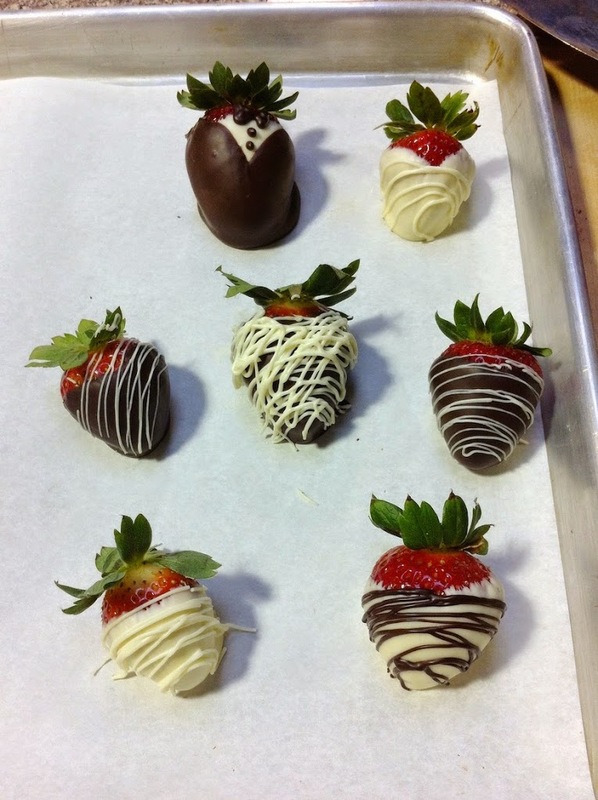 Today we mostly practiced with the chocolate and made some bowls and choc covered strawberries. 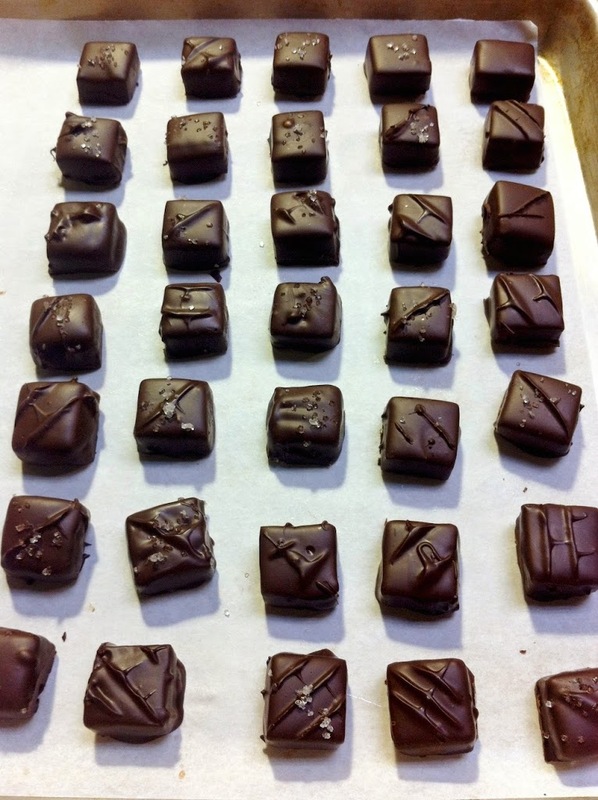 We also made candied pineapple and marzipan chocolates. Chef Stacy had been candying the pineapple for a couple weeks. We cut each slice into 8 pieces, rolled out some marzipan and placed it on the bottom of each piece, then dipped them in chocolate. No progress pics, sorry! 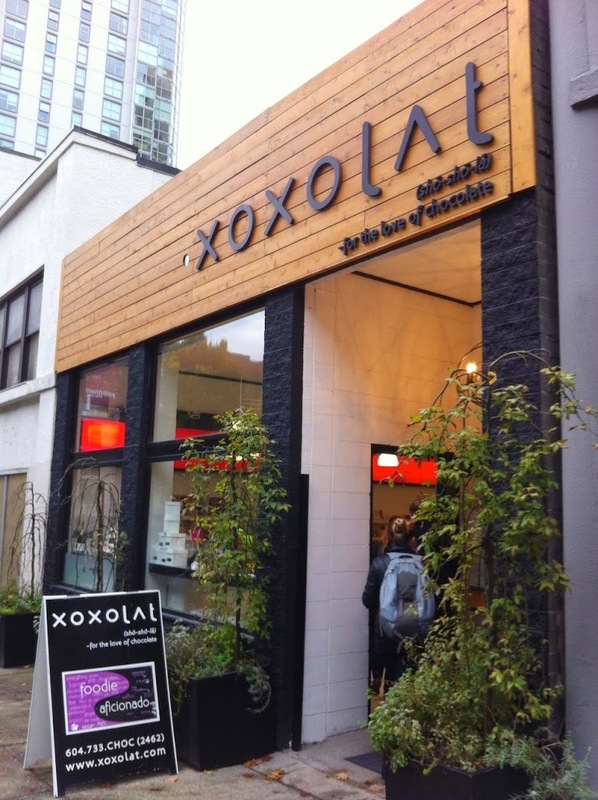 We wrapped up at about 2pm and headed to Xoxolat in Yaletown for a chocolate tasting. 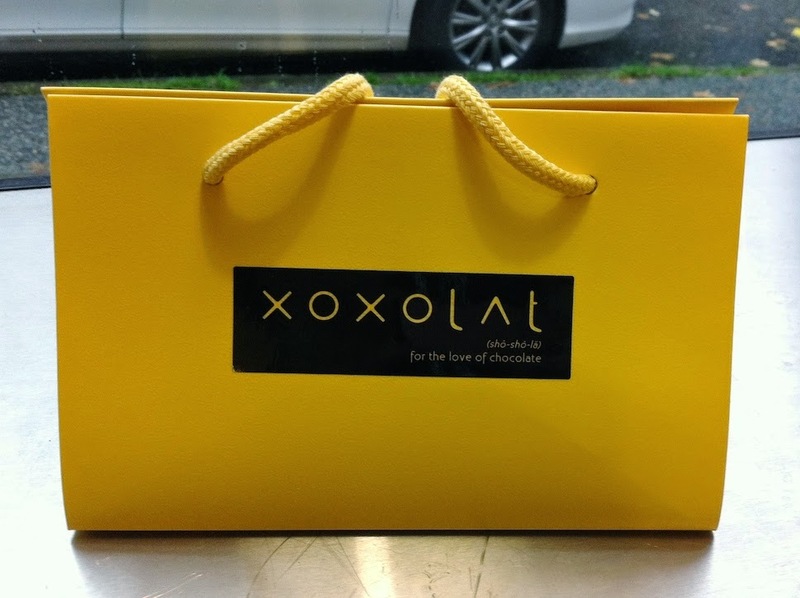 Xoxolat is mainly a retailer for high end chocolates. 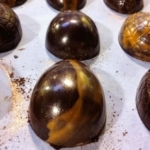 They do make some of their own in house, but this is the place to go if you are a chocolate lover and are looking to get brands from around the world. 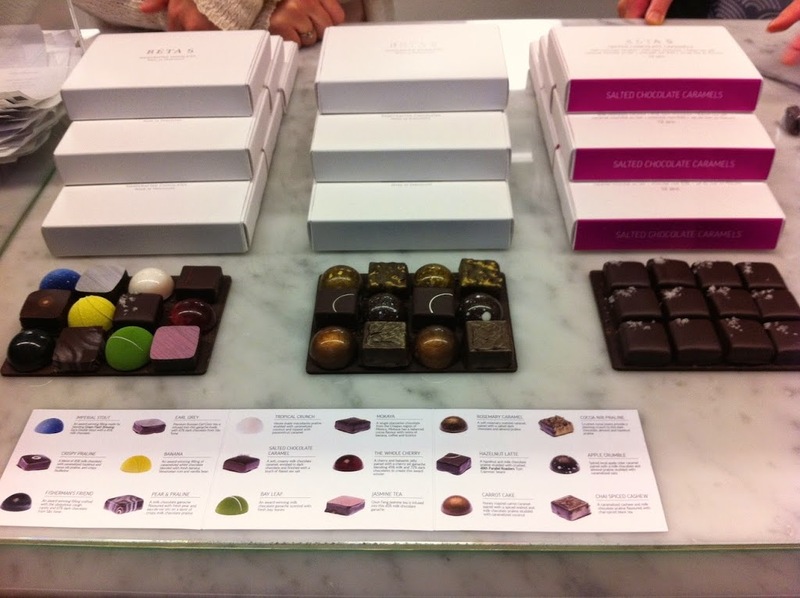 We were able to sample a bunch of chocolates and learned about the origins of them. Some of them were rather odd flavors and likely wasted on me. I’m a traditional kinda girl and prefer my chocolate to taste like chocolate…not like salt & pepper or tomatoes. Honestly, I feel like a lot of places try too hard to be different and unique. I appreciate the effort and experimentation, but I much prefer the classics. 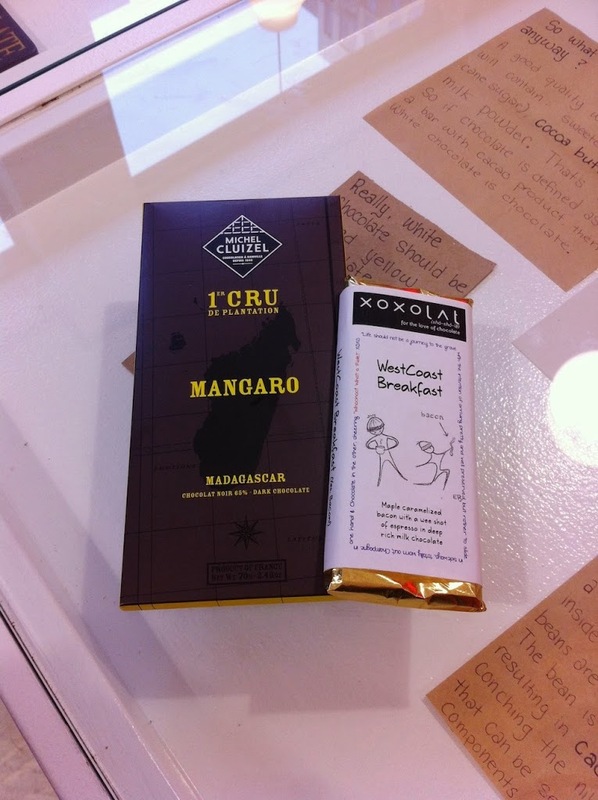 I did however love the chocolate with maple bacon made by Xoxolat. THAT was a good one. 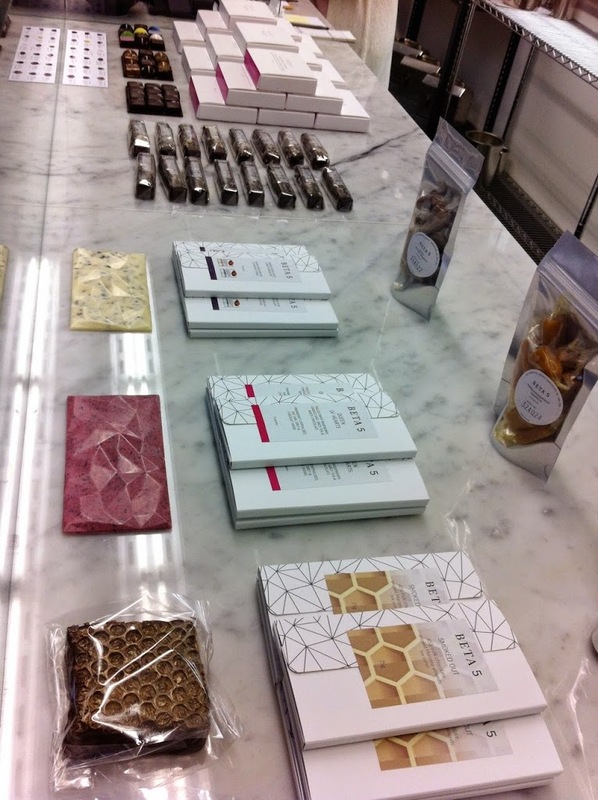 After the tasting, we were able to wander around the shop and check out their chocolates. I was pleasantly surprised to see Michel Cluziel chocolate bars here and had to buy one. While Ryan and I were in Paris, we’d get a little Michel Cluziel chocolate on the side with our coffees at Cafeotheque. Such a nice memory! I also had to buy the bacon one. Yum. And I’m a sucker for packaging. Love this! 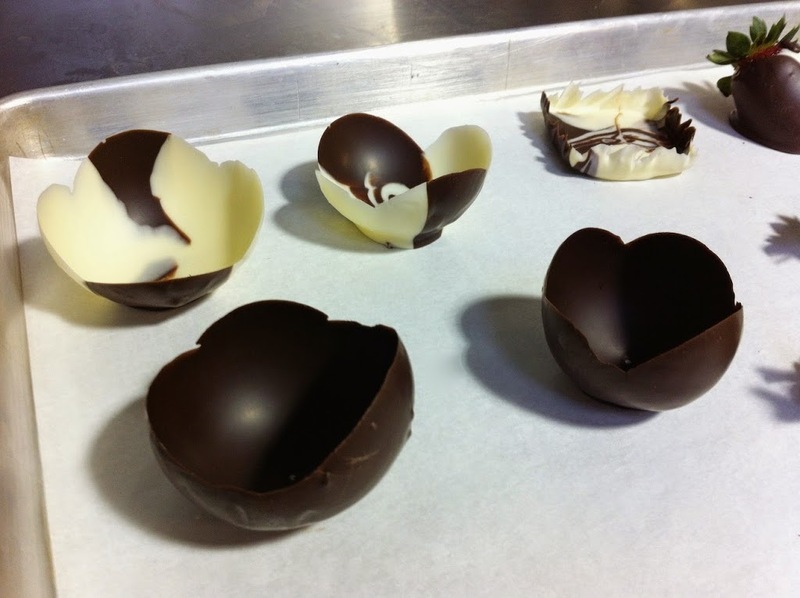 We tempered more chocolate today, but using a different method. 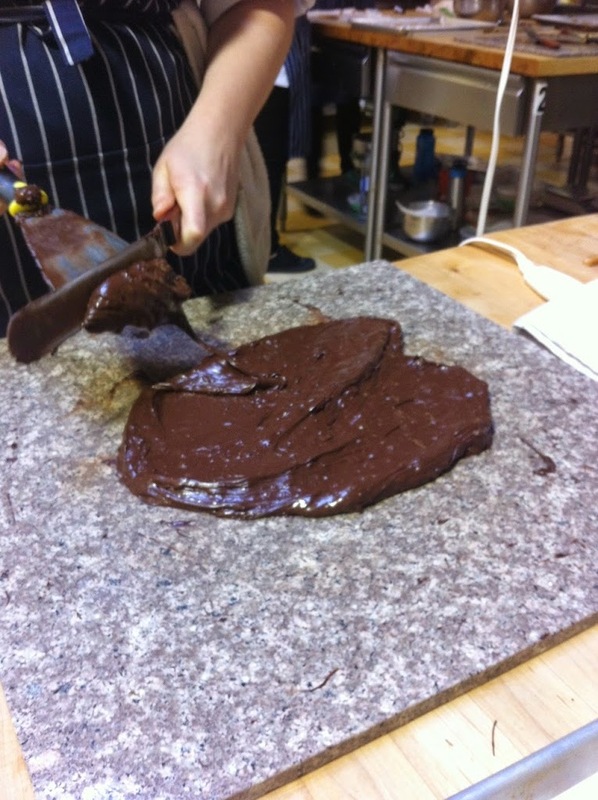 Instead of marbling, where you cool a potion of the chocolate on a marble slab and then mix it back in, we learned seeding, where you add unmelted chocolate into melted and let it do it’s thing. I find that this method takes longer and there will be lumps in your chocolate because not all the newly introduced chocolate will melt, at least not right away. I am not a fan of lumps. Even though the marbling method is messier, I like it better for the final texture of the chocolate. 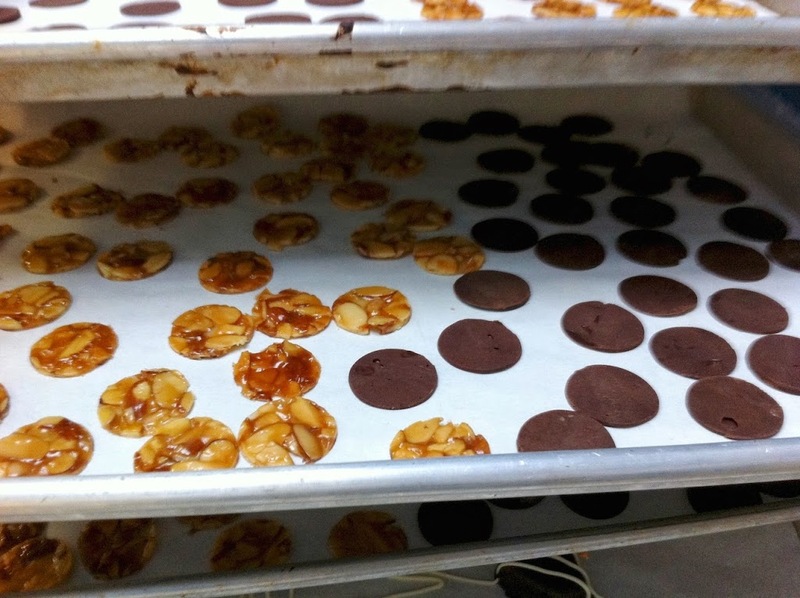 We made a few things today, some which will be used in chocolates over the next couple of days, like florentine discs and chocolate discs. Read on to tomorrow for those. 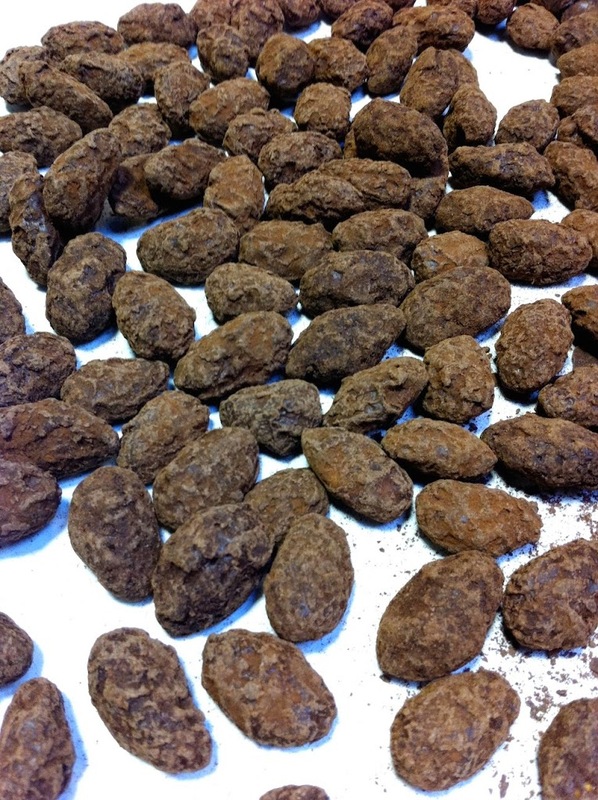 Then we caramelized some almonds, coated them in chocolate 3 times, then dusted with cocoa powder. I may have burnt them a bit when caramelizing, as they taste a bit bitter. Didn’t stop us from eating them! 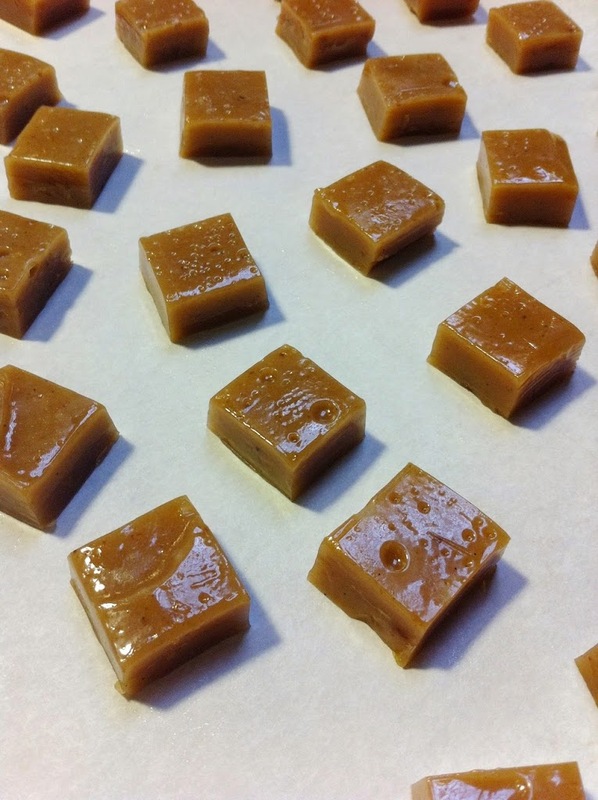 Finally, we made some caramel to be used in chocolates tomorrow. It’s infused with orange zest and tastes very orangey. 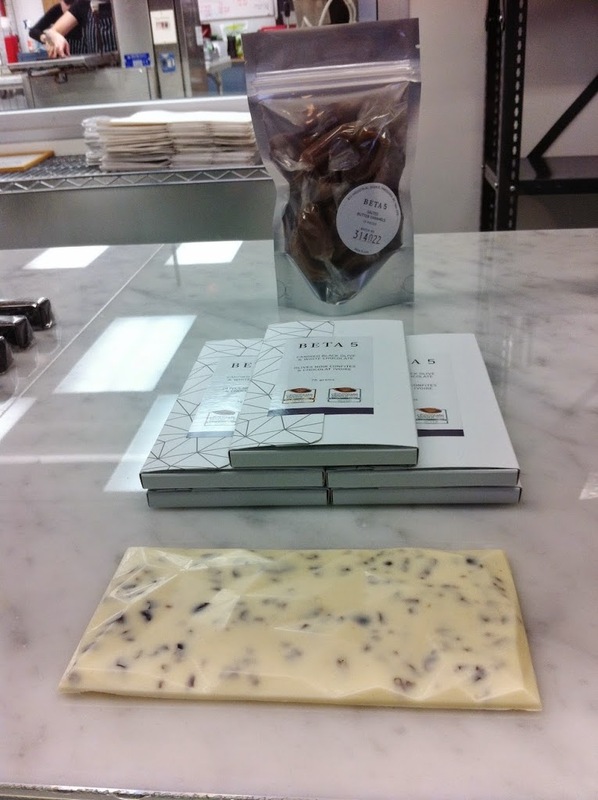 After that we had another field trip, this time to Beta 5, which is a chocolatier in Vancouver. The owner is actually an ex-grad from the Northwest Culinary Academy, so it was cool to hear his story. 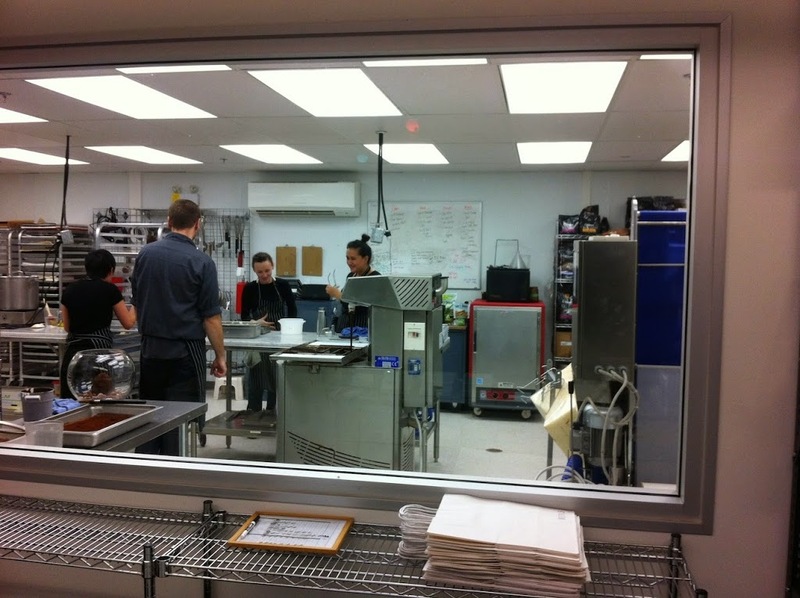 Here we got a tour of their chocolate production facilities and their pastry kitchen. It was really cool to see the chocolates being made. Their stuff looks amazing. I can’t even imagine how much time goes into making these! A lot of the flavors were really unique…bay leaf, jasmine tea, even Fisherman’s Friend flavoured ones (seriously). They actually won some pretty major awards for the last one! It tasted a lot like mint chocolate, so if you like mint and chocolate you’ll probably like it. Again, I preferred the more traditional flavors. 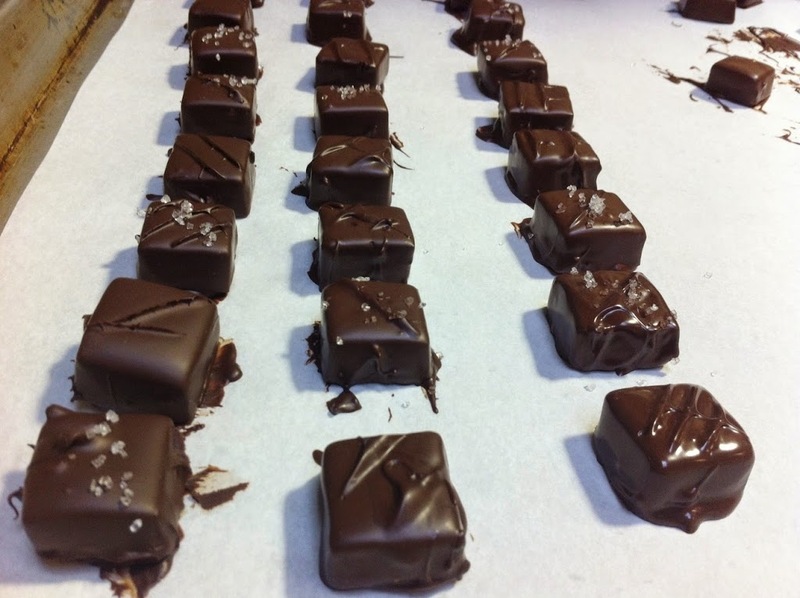 The morning was spent making 3 different types of ganaches, only one of which I actually got a picture of. 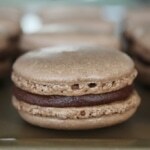 This one was an almond amaretto flavored ganache that went on top of the florentine discs we made yesterday. 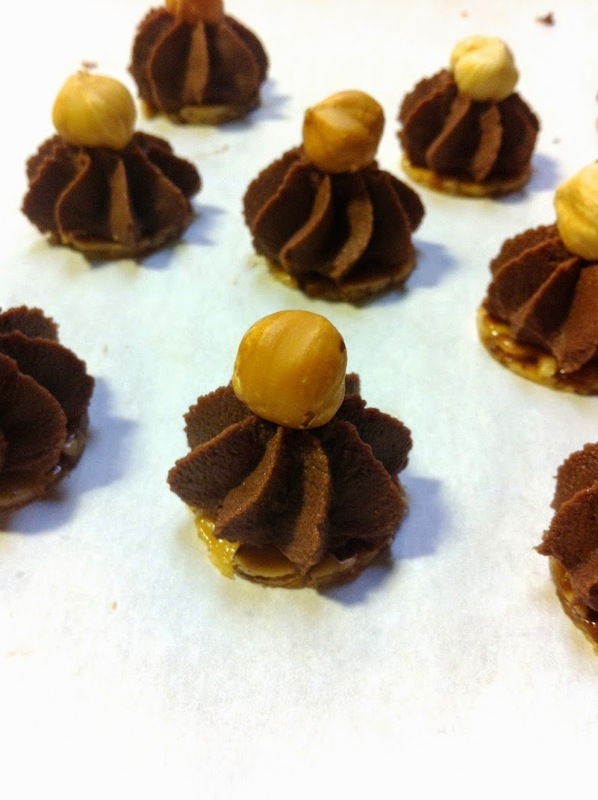 Each one was then topped off with a hazelnut and will be enrobed in chocolate on Monday. Delicious or what?? We also made a Raspberry ganache and a Palet d’Or ganache which was piped onto the chocolate discs and will also be enrobed in chocolate on Monday. 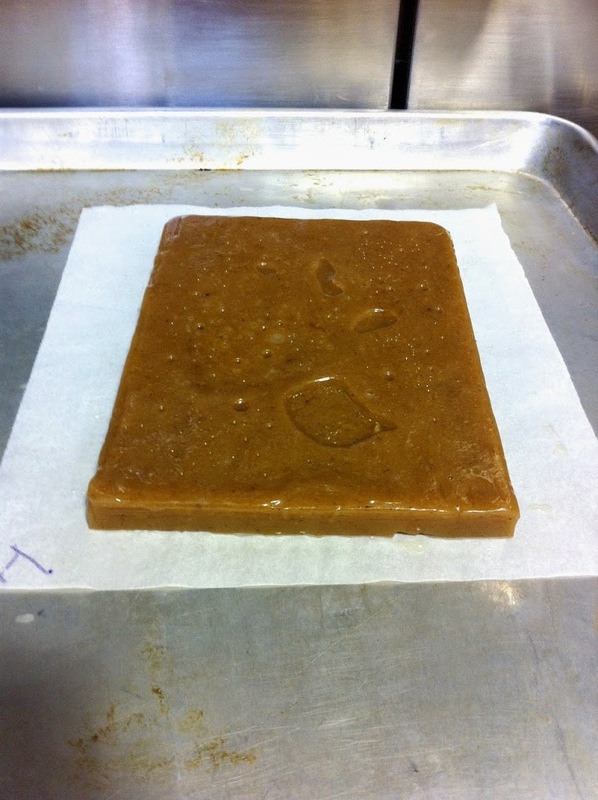 I’m not sure what the raspberry ganache will be used for yet, but we spread it out in a slab like the caramel. 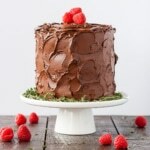 I imagine it will be cut and covered in more chocolate. 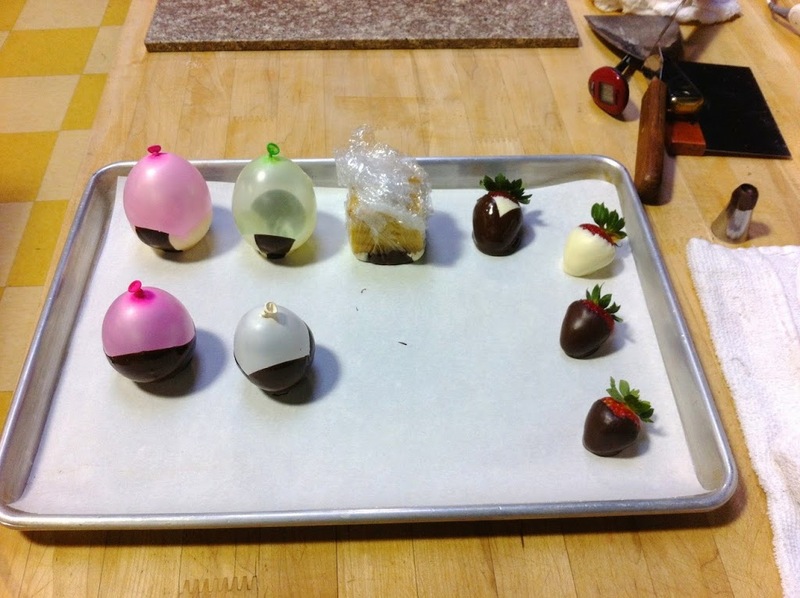 …and, you guessed it, dipped them in chocolate! Here’s Laura tempering our batch. 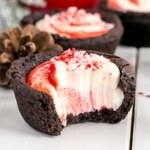 Each one was dipped into the bowl of chocolate using a chocolate dipping fork and sprinkled with sea salt. 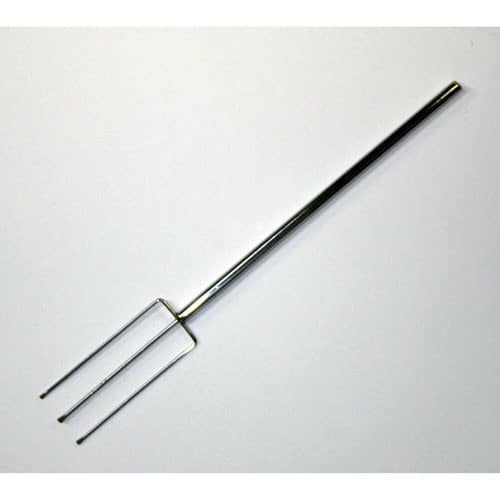 You could also decorate the tops of each by pressing the dipping fork into the chocolate before it hardened. I love how these turned out! It was a lot of fun decorating the tops, too. I haven’t really enjoyed chocolate week, but this was fun. 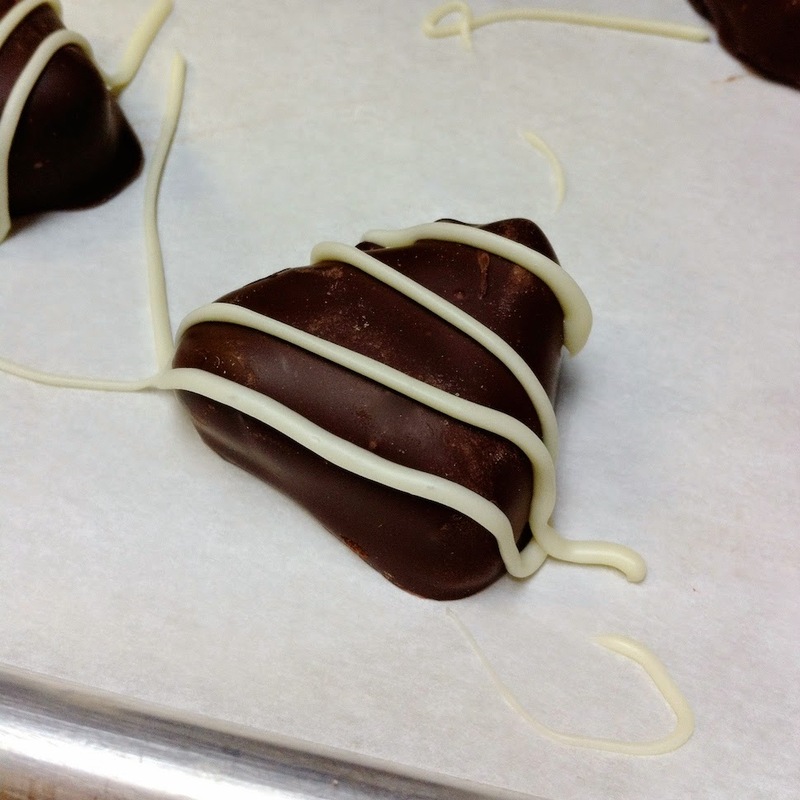 I could do it forever as long as someone else kept the chocolate tempered! 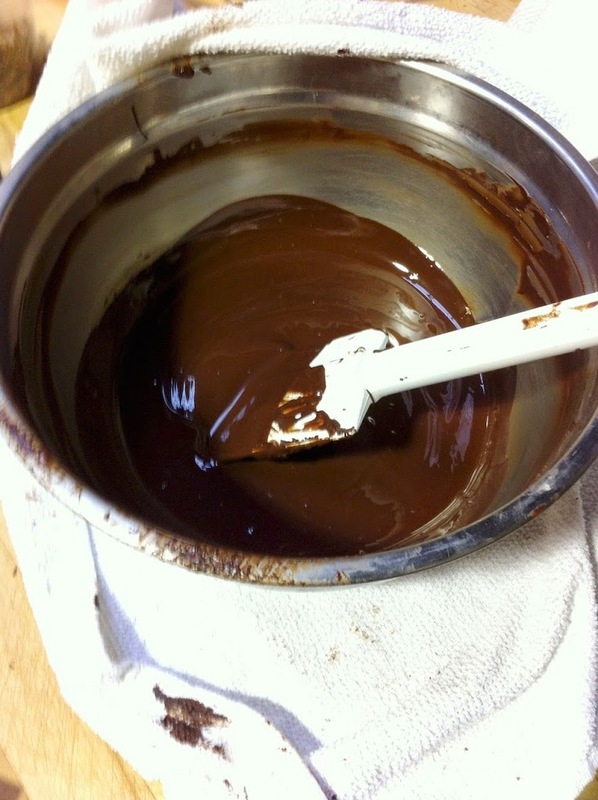 Laura, Sohpia, and I were all sharing one bowl of chocolate and one sheet pan to make our chocolates. Can you tell which side was mine? Hah. 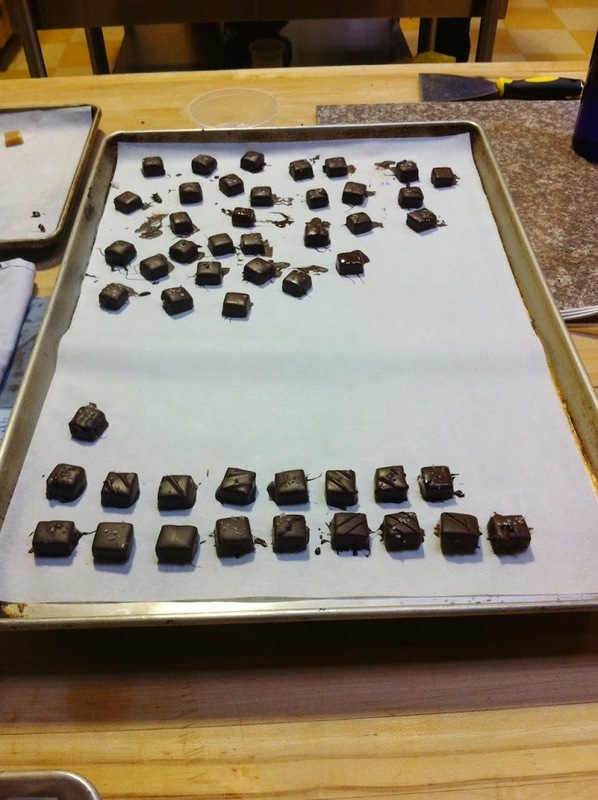 After the caramels were all coated (and sampled), we moved on to the final product of the day… Rochers. 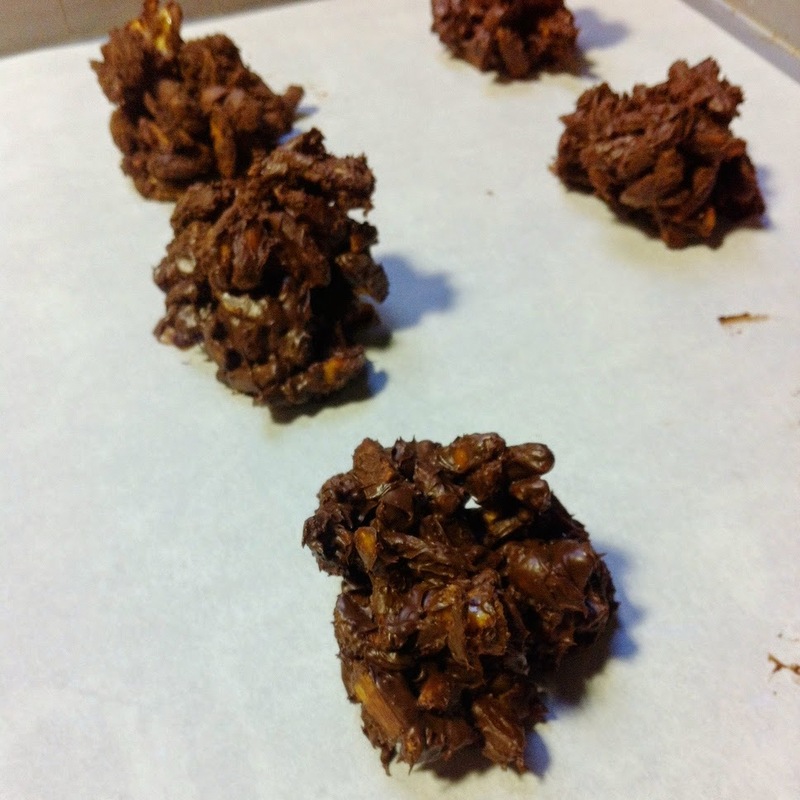 Not Ferrero Rochers (too bad), but these guys are clusters of caramelized slivered almonds covered in chocolate. We didn’t get to sample these guys as they needed time to set, so something to look forward to next week! We have a whole ‘nother week of chocolate ahead. I’m not extremely enthused, but it looks like there is a lot of variety in the recipes, and we’ll be making truffles etc. It’s crazy that nine weeks have gone by already…. It’s funny the things you miss (and don’t miss) about regular non-pastry school life… I haven’t been able to paint my nails since school started, and if you know me, this is a BIG deal. I always have my nails painted…. otherwise I chew them… so I miss that… I do not miss trying to decide what to wear in the morning (uniform and all), but I do miss dressing up every once in a while. All my pretty clothes (and shoes) are gathering dust. At least I haven’t really had a need/want to shop for anything, which is good since I have no money :).